In the Mahabharata, Dhritarashtra, the king of Hastinapur, was blind from birth. Yet he was aware of everything that happened in the world, thanks to his advisor Sanjaya, who had the gift of observing distant events. Today, Sumit Dagar, a Delhi-based designer, wants to create the technological equivalent of Sanjaya to help the visually challenged. He wants them to be able to feel what others can see. Dagar, an alumnus of the National Institute of Design, Bangalore, is developing a Braille smartphone. "There is a huge gap between what is usable for a normal person and for a handicapped person. Design is the only thing that fills the gap between technology and the user," he says. The project is in its first stage, which involves developing a Braille display for the handset. At this stage, the phone, says Dagar, will be bulky, particularly its display screen. The second phase will aim to reduce the thickness of that screen to three millimetres. And the final phase will involve the development of multimedia features. 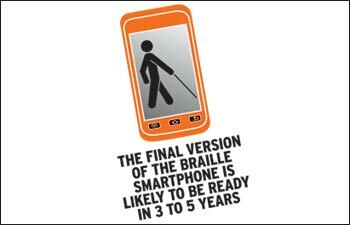 If successful, the phone will enable visually impaired people to "feel" images and videos. Some progress has already been made in this field thanks to advances in 'haptic' technology, which enables users to feel tactile sensations. For instance, Samsung's Anycall Haptic phone has a large touch-screen display that allows the user to feel 22 kinds of touch sensations, including clicks and vibrations. Dagar and his team of four expect to have a final version of the phone ready in three to five years. At that point, he says, the Braille phone will be able to form icons, shapes, figures, diagrams and so on in an elevated position, so users can feel them. He has been collaborating with Indian Institute of Technology, Delhi and L.V. Prasad Eye Institute, Hyderabad, to develop the product. India has the largest visually impaired population in the world - around 62 million who are either blind or visually impaired - according to the World Health Organization. Mobile devices currently available do not adequately address the problems of this community. Dagar, 29, was one of two Indians who recently received a Rolex Young Laureate award. He plans to use the prize money of 50,000 Swiss francs (around Rs 29 lakh) to finance the project. Until now, he had been relying on his own savings. After graduating from NID, the designer spent a few years in the corporate world but was "not happy" despite being in jobs that paid well. His decision to develop the Braille smartphone surprised his parents. "Now, my parents understand what I am doing and they support me," says Dagar. As does his wife. "I got married when I was unemployed, but she has been with me through the whole journey," he says.